The Camry's introduction in Europe will bring Toyota's hybrid lineup in the region to eight models. Toyota will launch sales of its Camry midsize sedan in Europe early next year to replace the discontinued Avensis. The Camry will go on sale in the first quarter of 2019 with a gasoline hybrid version only. Toyota will import the Camry into Europe from Japan. It will not replace Avensis production at the automaker's factory in England. No wagon version will be offered. European sales in the non-premium midsize segment have been declining for years and last year Toyota sold just 25,147 of the Avensis, compared to 120,436 in 2005, according to figures from JATO Dynamics market researchers. Toyota said it saw an opportunity to import a model with a low-CO2 hybrid drivetrain, which the Avensis lacked. "Its main purpose is for fleet customers," a company spokesman said. Low CO2 cars attract reduced company car tax in many European countries. The Camry hybrid combines a 2.5-liter gasoline engine with an electric motor. No CO2 emissions figure has been quoted for the European model but in Japan under a different drive cycle the car is rated as achieving between 70-85g/km of CO2. The Camry in Japan is 4885mm long, making it longer than the sedan version of Europe’s segment leading Volkswagen Passat at 4767mm. "Its rivals will be the likes of the Ford Mondeo, Passat, but it also has the potential to compete a bit more in the premium market, for example against the Audi A4," the spokesman said. "The car will be a bit bigger with a good spec.” No prices were given for the model. The automaker did not disclose European prices for the Camry. The European Camry is the same global model that was updated last year. It has long been the best-selling passenger car in the U.S., excluding SUVs and pickups. The new version was introduced September last year in the U.S.
Power for the Japanese-spec Camry hybrid is rated at 175hp and the engine is mated to a continuously variable transmission (CVT). The car is built using Toyota's TNGA architecture that also underpins the Prius, CH-R small SUV, new RAV4 compact SUV and next year's Auris compact. The Camry's introduction to Europe will bring Toyota's hybrid lineup in the region to eight models. The sedan will be launched at the Paris auto show in October, Toyota said. The model will be upgraded with different suspension settings and noise, vibration and harshness (NVH) tuned for Europe's higher road speeds compared to Japan. 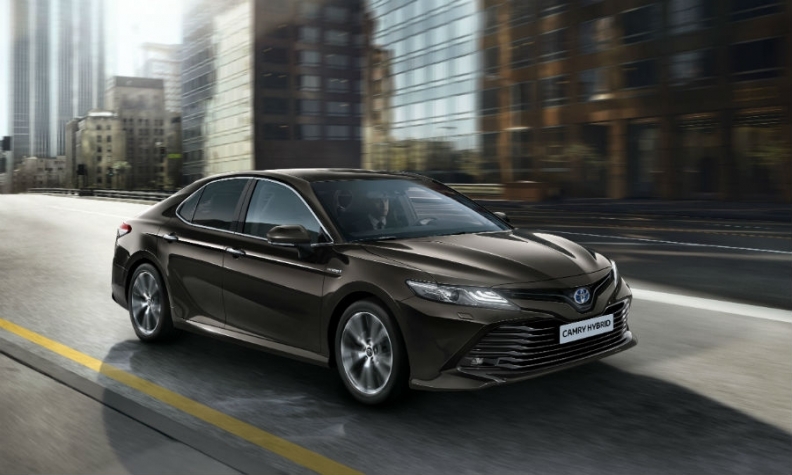 Equipment available in the Japanese Camry hybrid includes a head-up display, rear cross-traffic alert with auto-braking (to prevent car-park collisions) and a blind-spot monitor. Toyota stopped selling its Camry model in Europe in 2004 after poor sales. The company currently sells and builds the Camry in Russia.